WILLEMSTAD - A parliamentary delegation of the Dutch Senate and the Second Chamber will be part of the Kingdom Inter-Parliamentary Consultation (IPKO) from Tuesday, January 10 to Friday, January 13, 2017. Discussions include climate change, economic opportunities within the Kingdom and cooperation in the field of youth and health. 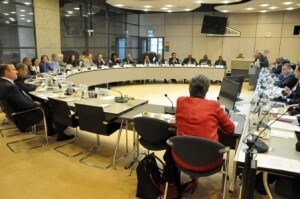 The IPKO is the consultative structure of the parliaments of the countries of the Kingdom of the Netherlands and usually takes place twice a year. During the upcoming IPKO topics such as technical legal and politics, Kingdom laws and integrity of government officials will be discussed. Furthermore, MPs will participate in several field visits, including to the Hospital Nobo Otrabanda (new hospital) in Curaçao. Prior to IPKO, the Dutch delegation will visit Bonaire and participate in a conference on poverty reduction with directors from the Caribbean Netherlands. The IPKO, which includes the parliaments of The Netherlands, Aruba, Curaçao and Sint Maarten will be chaired by the new President of the Curaçao Parliament Giselle McWilliam. The IPKO this year will have an informal nature, with an emphasis on mutual acquaintance and knowledge sharing. Reason for this are the recent elections in Curaçao and St. Maarten. Therefore, the composition of the parliaments of these countries have been substantially amended and no standing committees have been formed yet.